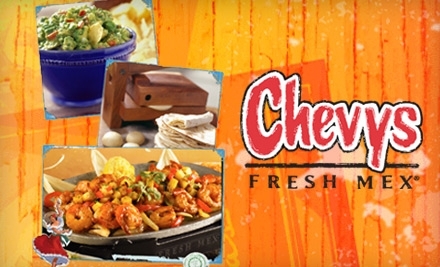 Chevys Fresh Mex was founded in 1981 by Warren Simmon and his son Scooter Simmon, starting with a restaurant in Alameda, California. By august 1993, it was acquired by PepsiCo subsidiary Taco Bell, and grew to 37 restaurants across California. Eventually, Chevys was acquired by Real Mex Restaurants, Inc. Today, there are over 100 Chevys Fresh Mex restaurants throughout the United States, with most of these (26 specifically) being located in Northern California. Chevys Fresh Mex is known for their Mexican-style casual dining restaurants. "Delicious simplicity in a casual but energized atmosphere where it’s all about the food" is their motto. Mexican fare is currently an integral part of the American dining experience, and Chevys Fresh Mex is right there at the helm of this experience. Enjoying a vast portfolio of restaurants and contemporary taquerías, these restaurants honor the flavorful history of Mexican cuisine, moving forward through culinary innovation, superior hospitality and rich infused flavors. They feature some iconic dishes based around grilled fajitas, like the Sizzling Fajita Salad with Mesquite-grilled chicken or carnitas fajitas, chilled romaine, San Antonio veggies, cotija& jack cheese, papita seeds, fresh Hass avocado, pico de gallo and tortilla strips drizzled with their apple-chipotle vinaigrette with Steak or Shrimp, and also the Famous Chicken Fajitas, which features Mesquite-grilled chicken breast marinated in fresh citrus and chilies, among many others. There are plenty of career paths available for those interested in this chain of Mexican food, both full and part-time. Management, marketing, Training, Food & Beverage, Accounting, Finance, Human Resources, Purchasing & Distribution, IT, Risk Management are some of the career opportunities. They value Respect, Recognition & Rewards, Accountability and Leadership, and they also strive to exceed expectations. They are confident about the future and recognize that they need to hire the best and brightest to meet their long term objectives; those who demonstrate dedication and passion by achieving consistent results will have ample opportunity to maximize their advancement opportunities. Restaurant management opportunities currently range from entry-level positions to multi-unit supervision. Broad choice of health care options for Medical, Dental and Vision.